This quaint homestay in Doon is straight out of the Victorian era and is an ideal retreat for anyone who needs a break from the city. We’ve come back with special love for their stunning antiques. Meet The Shumshere. The Shumshere is a gorgeous house that’s been around since the 1900s and has recently been turned into a homestay. It’s a lovely retreat in the middle of Doon, which quite honestly looks straight out of a fairy tale. The first look you get of the property when you pull up in the driveway is of their sprawling gardens, stone walls complete with ivy crawling all over and a checkered verandah lined with old-school arches. We stepped in to find ourselves in a hallway with rows of antiques, some in glass cases and some outside. On entering the main living room, we were instantly drawn to the archaic gramophone which takes the centrestage. The whole house is an antique lover’s haven and it’s easy to believe you’re stuck in the 20th century. We went on to explore the rest of the six rooms, each with four-poster beds and pretty floral drapes. All of them have been done up beautifully, with carved armchairs, wispy curtains and charming wall hangings. We fell in love with the rooms in the towers, cosy with plenty of sunlight streaming in. Almost all of the furniture is from the family’s personal collection, dating back to four generations and it’s amazing how everything’s in pristine condition. 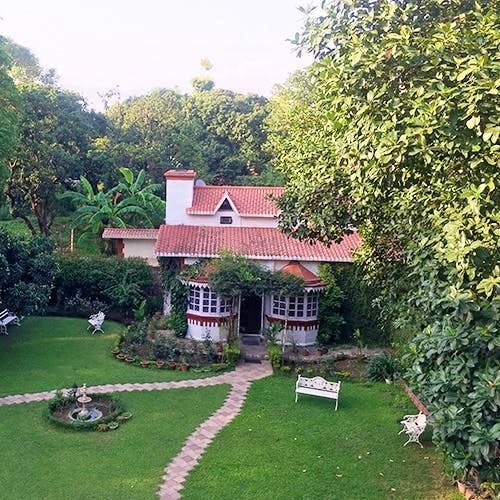 You can spend your evenings just lounging around the garden and playing with their five dogs, or have a fascinating conversation over a cup of chai about the antiques and history of the property with the owner, Daleep. P.S. It helps that the property is an absolute dream for photographers, each corner here is a charmer. If you’re looking for just a weekend away from the chaos of the city or want to spend some quality time with your folks, this is the perfect place for you. They’re planning on having yoga retreats and creative workshops, we’ll keep you updated about those. Their rooms start at INR 5,500 and go up to INR 7,500. The family-size cottage will set you back by INR 14,000. This is inclusive of breakfast. You can call the owners for a booking on +919811614478 or shoot a mail to them at theshumshere@gmail.com.